Dr. Roberto Comparelli (degree in Chemistry, 2001) got the Ph.D. in Chemistry of Innovative Materials at University of Bari (Italy) in 2004. 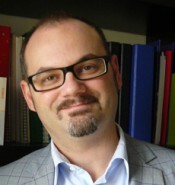 Since 2005 he is Staff Researcher at Italian National Research Council – Institute for Physical and Chemical Processes, Bari Division, Italy (CNR-IPCF). His expertise covers nanocrystal (NC) synthesis by wet chemistry (photoactive or magnetic oxides, II-VI semiconductors, metals), characterization (TEM, SEM, AFM, FT-IR, UV-Vis-NIR, PL) and their surface engineering. He is interested in NC incorporation in polymer matrices, application in optoelectronic, self-assembly, biological and environmental fields. In particular, he has strong background in the application of photoactive NCs in degradation of organic/inorganic pollutants in water and gas matrices and in the preparation and characterization of NC-based self-cleaning coatings. He has been involved in 5 EU projects (6th and 7th FP), 9 Italian projects and 6 projects funded by Apulia Region. He is the scientific director of research contracts with multinational companies aiming at the synthesis and characterization of innovative nanomaterials. He is member of the editorial board of “Journal of Chemistry” (ISSN online: 2090-9071; doi:10.1155/2962) and “Journal of Nanostructure in Chemistry” (SpringerOpen; ISSN: 2193-8865). Referee for several high impact factor journals (ACS, Elsevier, RSC, Springer, etc.) He has co-authored over 80 papers (> 65 JCR publications, 17 publications in peer reviewed International Conference Proceedings, 6 book chapters, 1 international patent) and more than 150 contributions to National and International Congresses and Symposia also with invited talks. Supervisor of several PhD theses (Univ. of Bari) and Degree Thesis for the Degree course in Chemistry and Degree course in Science and Technology of Materials (Univ. of Bari). 2002 – present: Teaching activity at Univ. of Bari (seminars and laboratory exercitations on nanocrystal synthesis and characterizations). 2002 – 2004: Teacher of Chemistry Exercitation Course; Degree Course Civil Engineering; Politecnico di Bari. His expertise covers NC synthesis (photoactive or magnetic oxides, II-VI semiconductors, metals), characterization (TEM, SEM, AFM, FT-IR, UV-Vis-NIR, PL) and their surface engineering. He is interested in NC incorporation in polymer matrices, application in optoelectronic, self-assembly, biological and environmental fields. In particular, he is interested in the application of photoactive materials in degradation of organic/inorganic pollutants in water and gas matrices. Expertise in optical (UV-VIS absorption, photoluminescence, FT-IR) structural (SEM, TEM) and morphological (AFM, STM) techniques.